Freebie: Junior Explorers Free Subscription Box! 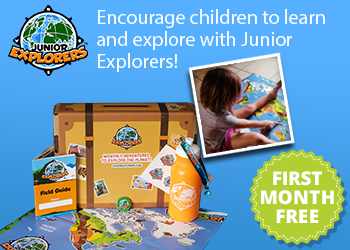 For a limited time only, get 1 free adventure kit to Junior Explorers!! Junior Explorers is an award-winning subscription program that teaches kids all about wildlife and nature. Kids receive a kit in the mail every month which sends them on a virtual adventure to a new ecosystem to learn about the animals that live there. Junior Explorers' adventure kits contain fun collectibles like wristbands, pins, figurines, and activity books to prepare kids for their mission. A secret code inside the kit unlocks Junior Explorers' online adventure, where kids play fun learning games to solve a mystery in nature. Don't miss this one-time opportunity for Junior Explorers' best deal! You must use code FREEOCT to receive the free month. FREEOCT is available for new subscribers only, is limited to one use per person, and excludes shipping, which is only $3.99 per month in the Continental US. Plans automatically renew and subscribers may cancel at any time. Junior Explorers is an excellent monthly subscription box for your little one (ages 5-12) that is packed with activities and educational materials to stimulate your child's imagination and promote discovery of wildlife and nature. My son was so excited when our box arrived. He thoroughly enjoyed the activities and playing with the mini clown fish and whale. He has a "quiet time" every day while my daughter naps, and this kept him entertained the entire time, and he is still playing with and learning from everything that came in the box. The prices are very reasonable, with greater savings on multiple month purchases. Check them out here. You can also go online, solve the mystery, and play games with the code you receive. Kia and Kyle accompany your child on every adventure. Together they will explore amazing places like the Arctic, Serengeti and Amazon. Junior Explorers combines all things kids love creating science kits with cool collectibles and activities and fun online games.